Kwara South Senatorial Aspirant, Engr. 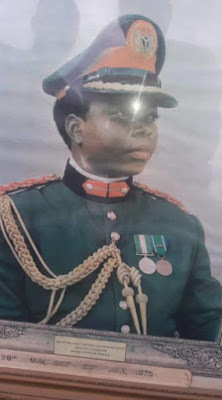 Nurudeen Adeyemi Balogun has described the death of the first Military Governor of Kwara State, Gen. David Bamigboye as a great loss to the people of Kwara South and the entire Kwara State by extension. Nurudeen Adeyemi, stated this today, while commiserating with the entire family of late Miltary Administrator and the people of Omu-Aran community at large. In his words, "Brigadier General David Bamigboye was a unique pathfinder, an iconoclastic personnel whose wealth of military and administrative experiences have not been matched in the history of our state". He further said that Bamigboye "was an agitator of freedom whose beaming light of positive development became a model for every well-meaning individual in Kwara South and the state at large". The ENACT principal expressed sadness over the timing of the death of this great man. "Unfortunately, his services are mostly needed at this time of a new democratic transition to put the District and the state on the path of sustainable reformation" said Adeyemi. He however prayed for the repose of the deceased and the fortitude of the expanded family to bear the irreparable loss.